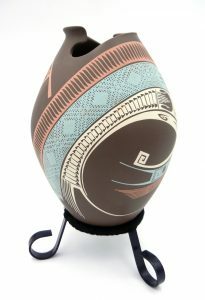 In the early 1970’s, a Mexican railroad worker named Juan Quezada began reproducing pottery in the authentic traditions of Casas Grandes. Today, his pots are in the permanent collections of the Smithsonian, and he is the foremost living ceramic artist in Mexico. Most of Juan’s family, and over 300 other households in his village of Mata Ortiz now follow his path. Mata Ortiz pottery is formed by only the potter’s hands; no potter’s wheel is used. The clay is obtaine d locally with a pick-axe and shovel, as are the paints. Materials are not store bought. 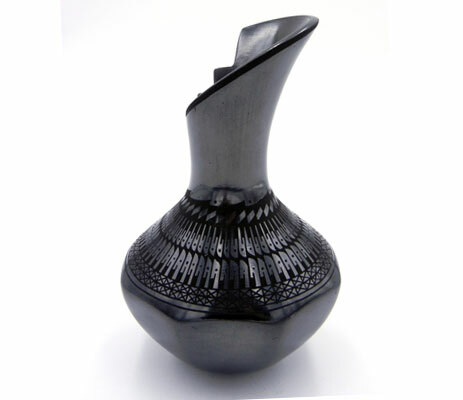 Once pieces have been molded and decorated, they are dung-fired on the ground, not in a kiln. All pieces are signed with the artists’ hallmarks or signatures. 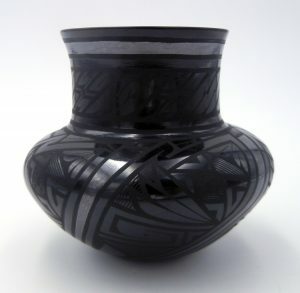 Casas Grandes (Mata Ortiz) pottery began as a revival of a prehistoric ceramic tradition, but has deeloped into an artistic style, unique among all ceramic artists.